The Corvette ZR1 was an insane car and is now insanely cheap. From 2009 to 2013, the ZR1 was the most powerful Corvette money could buy. Although the new Z06 does have more power (650 hp), the 638-horsepower ZR1 is still no slouch with a top speed of 205 mph. The 6.2-liter supercharged LS9 was a beast and helped the Corvette challenge the likes of the 997 Porsche 911 Turbo. While the Porsche did have AWD it had to make do with just 500 horses. The LS9 in the ZR1 made more power than a Porsche Carrera GT and can now be yours for less than $50,000. We found a 2010 model with just over 75,000 miles on it for sale in Birmingham, Alabama, for $49,887. For this insanely low price you will be getting a Corvette with a carbon fiber roof, fenders, front splitter, and rocker moldings. Carbon ceramic brakes are included and painted in blue along with the intercooler trim and ZR1 badges. You can see the intercooler thanks to a little polycarbonate window in the hood. The ZR1 also came standard with magnetic ride control that allows the car to adjust its stiffness based on road conditions. 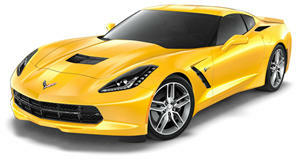 The ZR1 hit 60 mph in under four seconds and could pass through the quarter mile in just 11.7 seconds at 127 mph. Even compared to a new Corvette this is fast! The ZR1 was an insane car when it first came out, and remains an insane car even by today's standards. The original price was $104,000, so being able to buy one for less than half of that price is pretty spectacular. This is the perfect car for a Sunday drive or to show off at a Cars & Coffee event. It has a bit of mileage on it but so long as you aren't using it as a daily driver you should be good to go.